This card just makes me smile when I look at it. Isn't that why we make cards...to make people smile... and my husband smiled all day on our anniversary after he opened this card that I made just for him. 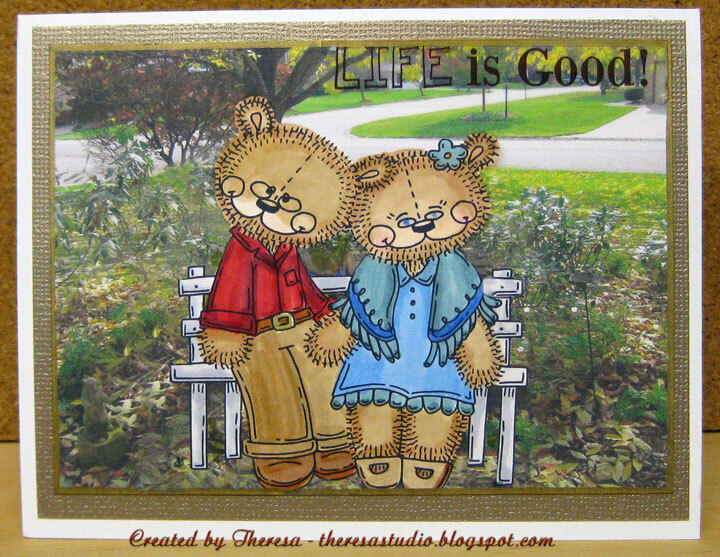 I used a Meljens digital image "Teddy Bear Couple" that I won from Tuesday Morning Sketches this week. 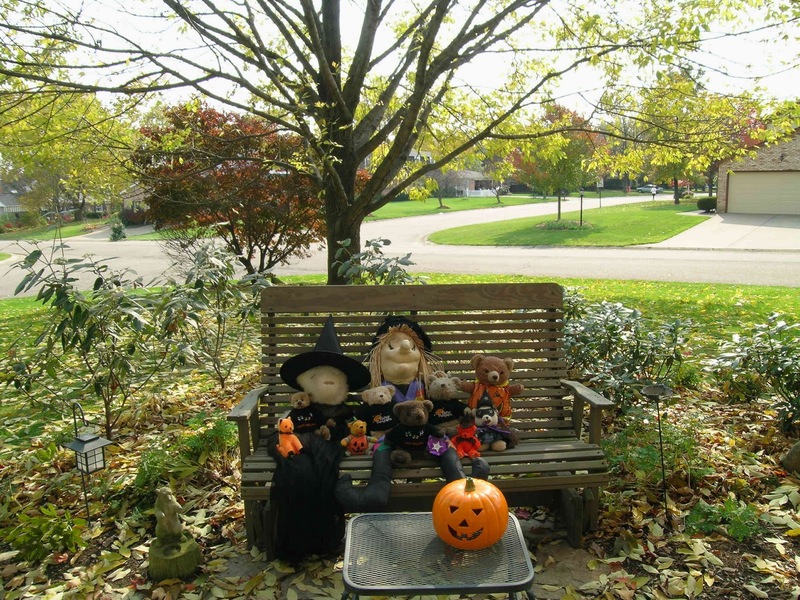 I merged the digi image onto a photo taken several years ago of a special spot in our yard of a bench where we love to sit together. This was done through the magic of Photoshop. The photo on the right was made during Halloween. I then printed the scene and colored the digi with Copics. Completed the card with a sticker and edged with a gold marker which partly covered the sentiment. Oops. Used a gold metallic mat from DCWV and attached to base card. This area in the yard has more mature trees and plants now...just as we are now more mature ( a nicer way to say we getting older). Just happened to come across a challenge that fits this card...could not resist it. Digi Doodle Shop: These are my Peeps-use any type of image (Stamp, photo, etc.) of a Person and/or People. It can be someone you know, or not at all. Teddy Stampers: Fall colors....there are fall colors in trees and background. What a clever thing to do for a special card! Thank you for playing along with us at Digi Doodle Shop's Best and good luck! This is a Beary cute anniversary card. I love what you did with your photo shop program. I love it! It's so darn cute!!!! you are so good on the computer! Adorable! I bet he loved it! Love how you used your picture background as the background for this darling image! I can just imagine the smile on hubby's face! I bet you DH smiled! This is so sweet, love your little images. This is so creative Theresa! Thanks for sharing this idea! 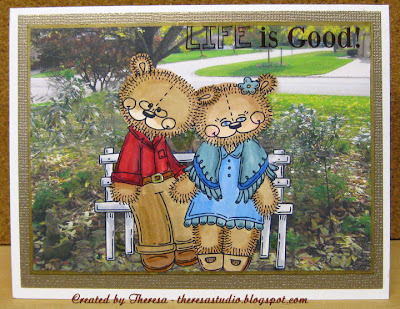 I'll bet your hubby did smile when he saw this special place on your card with the sweet little aging teddys. Very Cute! Oh my the magic of the spot and photoshop! So very creative and fun idea as well. I love that they are sharing your special spot! The bears are just too cute as well!! Such a fun card! Thanks for playing again with our challenge this week over at Paper Cupcakes! What a sweet story and card to go with it! Thanks for joining us this week at Paper Cupcakes! Pretty cute card!! Thanks for joining our challenge at Digi Doodle Shop's Best. OMG that is so darn cute! I love the image on that background! :D Thank you so much for joining us at Digi Doodle Shop's Best! Hugs! Life really is good. And to make the person next to you happy is do great! Wish you lots and lots more anniversaries together. What a lovely story I love your card so clever to use the background photo.